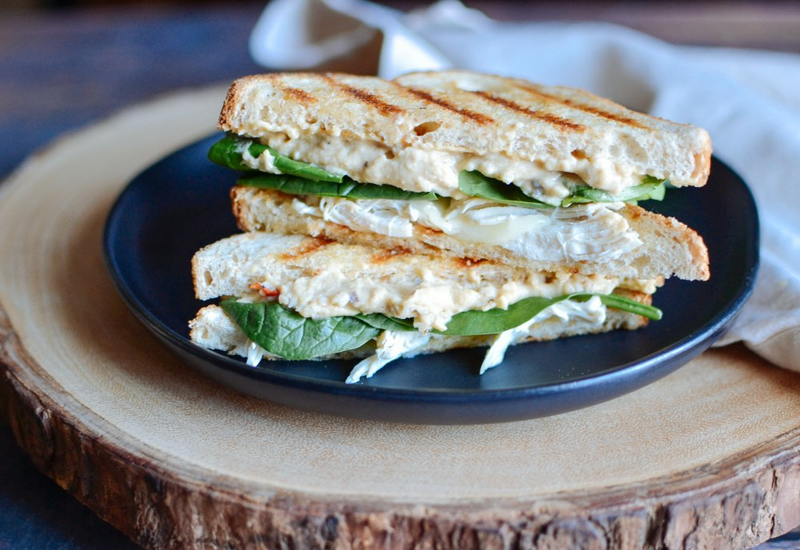 These easy and delicious grilled sandwiches feature hummus, grilled chicken, spinach, and melted provolone cheese on whole-wheat bread. Cook them in a sandwich press and you have a perfect lunch or dinner option. Get creative and try Kalamata olives or sliced roasted red peppers in these sandwiches as well. Try some of your favorites to keep the idea fresh for you and your family! The quick herb seasoning on the chicken breast tastes great with a variety of Mediterranean-style fillings. Per Serving: 583 calories; 28g fat; 44.7g carbohydrates; 42g protein; 64mg cholesterol; 1306mg sodium. This is a simple sandwich, but really delicious. I love using the hummus as a spread. This really works well with chicken or turkey, I've tried it with both. My husband also really likes paninis, so he loves it when I make these. I add extra chicken to his, and he's happy. My wife and I have a panini press that we weren't getting a lot of use out of, so we decided to try this recipe. I really like hummus, chicken, and spinach, and throwing it all on a sandwich together is quick, easy, and delicious. We've made it a few times already, and take it to work for lunch. The best part is that our kids also like to eat it! We have not had success getting them to try hummus before now. Now they ask for it all the time. I used store-bought fire roasted red pepper hummus to make this sandwich and it was really easy to do and delicious. Definitely going to make it again, probably with a different flavored hummus next time. Perfect marriage of Middle Eastern flavors with Italian flair. Instead of doing a a panini we used pita bread. It was so good! I made a turkey, hummus, and panini sandwich instead. I also used just oregano, salt, and pepper for flavor. It was pretty good. Great for a quick lunch and cheaper than store-bought.